Strengthening democracy around the globe through private enterprise and market-oriented reform. CIPE is one of the four core institutes of the National Endowment for Democracy and an affiliate of the US Chamber of Commerce. Since 1983 CIPE has been working from the ground up with partners to find locally driven solutions to problems that affect the lives of millions of people. We at CIPE believe that democracy is at its strongest when the private sector is flourishing. Working with our local partners that include business associations, chambers of commerce, think tanks, universities and advocacy organizations, CIPE is helping create the enabling environment for business to thrive. This can only happen when the core institutions of democracy are strong and transparent. We are there to help build those institutions. That is our mission. That is our strength. Support CIPE in its efforts to build democracy and support businesses around the globe. We are the only institution that works to simultaneously support democracy and strengthen the private sector through local partners with our local partner model. Keep up with our latest updates, propose a project, become a partner, and more with the links below. There are many ways to support our work, collaborate with CIPE, or become a CIPE partner. 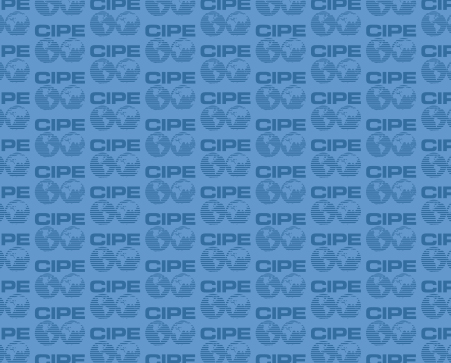 Follow this link to stay up to date on all the latest news, events, articles and announcements from CIPE.